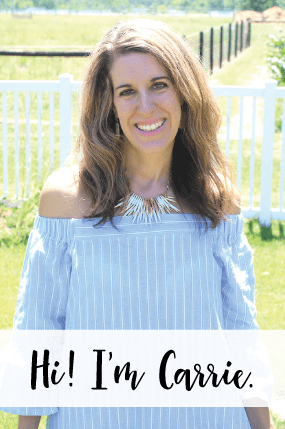 It gets a little dangerous when Brian and I get in the kitchen together… we both love to cook and Brian always comes up with something to make a recipe I’m making just a little better. This weekend I made an apple pie with an oatmeal streusel topping and Brian made a salted caramel sauce to drizzle over it. This is seriously the best pie I have ever, ever made. You will be licking your plate clean, I promise. So, why did I decide to bake a pie this weekend? Well, for one… Autumn and I went to Eckerts last Friday for her field trip and picked 2 heaping bags full of Jonathan apples. 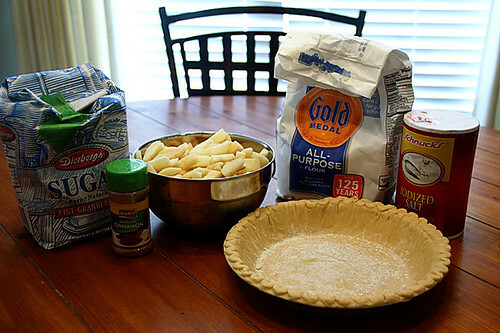 And two, it is on my Fall Bucket list to bake a pie with the kids. My least favorite part about making an apple pie is all of the apple peeling involved. 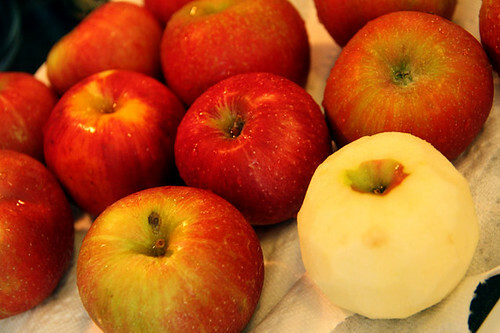 I use a potato peeler to peel the skin off of the apples and then I thinly slice them. 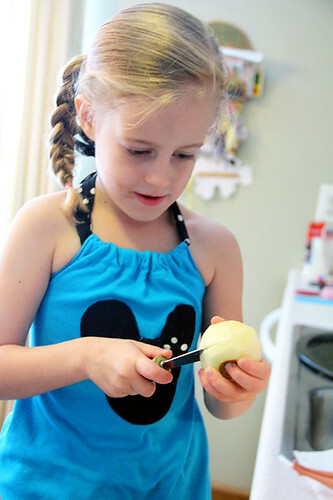 Autumn wanted to help me peel the apples, but I didn’t want her around a sharp knife. 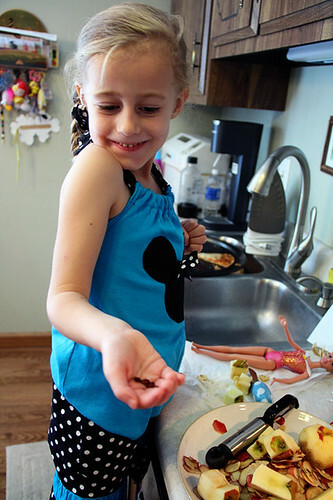 I gave her a butter spreader to make little cuts into some apples… it kept her happy for the time being. 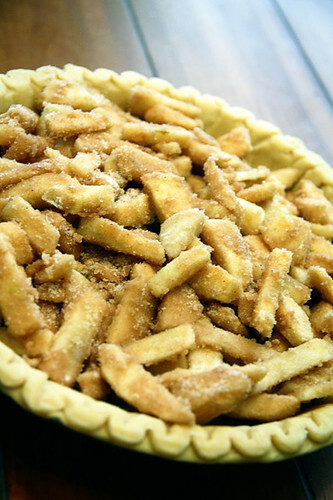 This recipe is really easy once you have the apples peeled… The ingredients for the pie are: pie crust, sugar, flour, cinnamon, salt and 6 cups of thinly sliced and peeled apples. 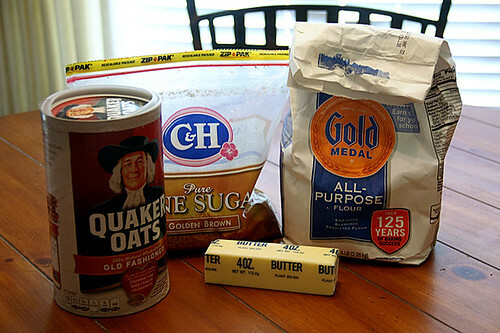 Ingredients for streusel topping: brown sugar, flour, quick cooking rolled oats and butter. 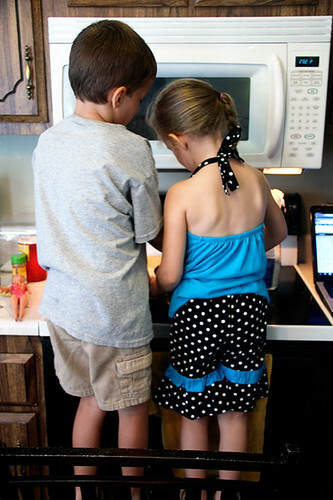 These two wanted to help me every step of the way… I really loved that Nathan wanted to help, too… he usually isn’t interested in helping when I am making something in the kitchen. Autumn always is!!! I love this photo dearly. 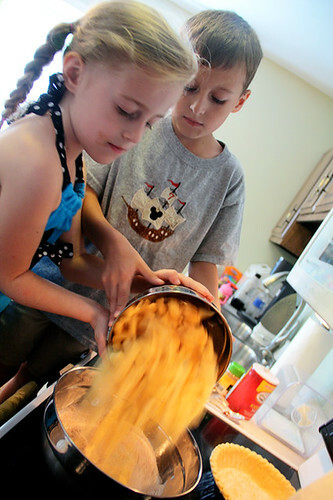 Dumping the apples into the sugar mixture. And this is where I lost my little helpers. I made them each a little bowl with the slices apple with sugar on them and they enjoyed them while I finished up the rest of the pie. 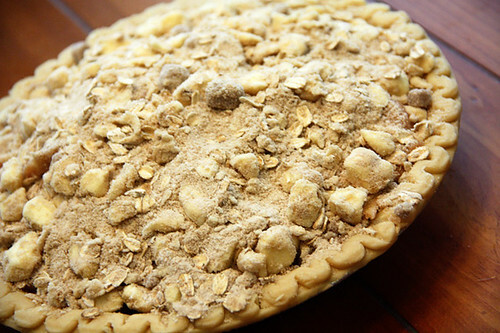 I dumped the sugared apples into the pie crust. Crumble the streusel topping on top of the apples. Then follow the baking directions. 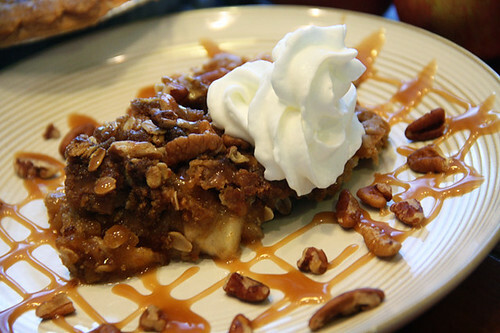 Let it cool and garnish a slice of pie with the homemade salted caramel sauce, pecans, whipped cream… you name it. Isn’t this a beauty?!! 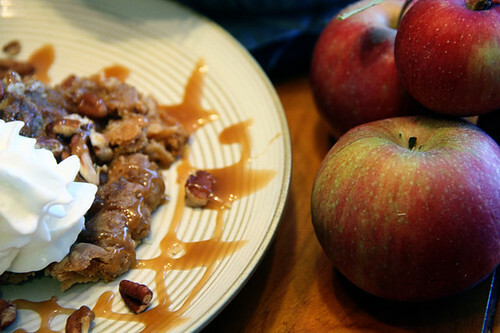 This would be a wonderful twist on a regular apple pie to make this Fall season. Try it, you’ll like love it. Aren’t the little baby apples that Autumn picked so cute next to the pie? 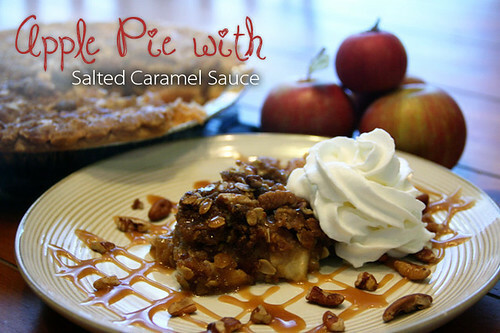 The salted caramel sauce really added a lot to this pie… I loved to get a little caramel off of the plate onto each forkful of pie that went into my mouth. So delicious. 2. In large bowl, stir together sugar, flour, cinnamon and salt. 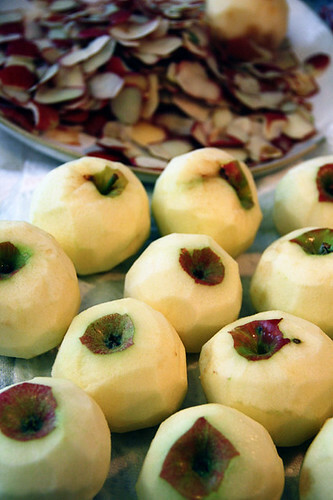 Add apple slices and gently toss unitl coated. Transfer to pie plate. 3. Mix stir together sugar, flour and oats for topping. Using a pastry blender or two knives, cut in the butter until it resembles coarse crumbs. Sprinkle over pie. 4. Cover edge of pie with foil to prevent over browning. Bake at 375 for 25 minutes. Remove foil and bake for additional 25-30 minutes. 5. Remove from oven and sprinkle with pecans and drizzle with caramel. 1. Have all the ingredients ready to go, poured and measured out before starting this recipe. Sugar cooks quickly, and you won’t have time to search for things. Also, please be careful. Melted sugar is very hot, and can burn you if it touches you. 2. Pour the sugar, salt, Karo, and water into a medium to large heavy sauce pot. Whisk it until it all dissolves. It will look like milky white water. 3. Turn the heat all the way up. Whisk it constantly until it starts to boil. 4. When the liquid reaches a rolling boil, you can stop whisking. Whisk it occasionally and watch the color. 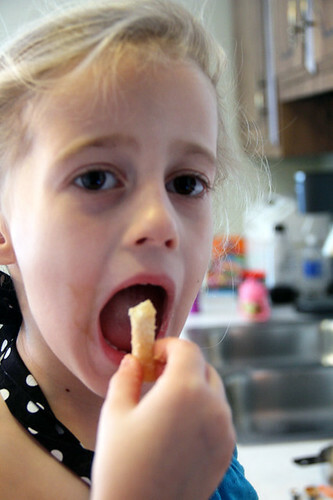 As all the water boils off, and the sugar starts to melt, it will turn a darker and darker shade of brown. 5. Once it reaches a medium brown, about the color of brown sugar, add the butter and whisk vigorously until all the butter is melted. It will bubble up to about double it’s original volume. The caramel will change to a slightly deeper brown as you add the butter and cream, this is caused by the sugar reacting with the milk fat. 6. When the butter is melted, remove the pot from the heat. Pour in the cream and whisk again until smooth. 7. Allow the caramel to cool in a Pyrex container with a spout. Once cooled, pour it into a plastic squeeze bottle. It will keep for about 3 days on the counter, or for a month in the refrigerator. If you refrigerate it, you can microwave the bottle for 30 seconds to help it pour easier. 8. Cleanup: If there’s any caramel stuck to the pot, fill it with water and bring it to a boil. All the caramel will dissolve and wash away.